If you remember Radcliffe College you are probably a little older than you care to admit. Radcliffe was absorbed into Harvard and officially ceased to exist in 1999, though it really disappeared once the agreement with Harvard was signed in 1977. I captured this scene about a week ago on a beautiful sunny Saturday when it seemed all of Boston was strolling through the Common and Public Garden. 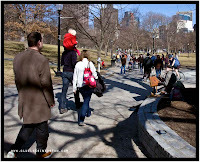 You can see some of the strolling Bostonians and other visitors in the photo on the left. Nice trip down memory lane, and a good photo as well. He doesn't look like the kind of guy I would immediately think of to be playing a dulcimer. But that, in a way, enhances the photo. Interesting post, thank you. There's a lot of nostalgy in all that.. Your memories, and this old man playing alone without anyone stopping for listening to him..Luckily, the sun shining is lightening themood.. The tune "'tis a gift to be simple" runs through my head when I see a dulcimer. They are one of my favorite instruments when well played.